This is the legendarily-awful Howard Hughes-produced turkey in which Big John Wayne is incredibly miscast as Big Genghis Khan. However, miscast though he was, Wayne got the part because he wanted it, and you can see why: the role fulfills the male barbarian fantasy in which manly men kneel to you because you’re the toughest, the loudest, and most brutal, and desirable women love you even though you beat and sexually assault them because they just can’t help themselves. Also, Mongol mustaches. Nothing in this noisy shambles of a movie makes a lick of sense, it’s just nonstop riding and raiding and abductions and surprise attacks, which always work because everyone on every side is a total dope who will fall for anything. Wayne’s “blood-brother” Jemuga (Pedro Armendariz), supposedly a brilliant tactician, gets captured no less than three times by his enemies, which are everybody. The Mongols hate the Merkits, the Merkits hate the Tartars, the Tartars hate the Mongols, and everybody hates the Han Chinese. (Accurate.) There are plots and counterplots, and everybody goes blundering about the desert at a full gallop while waving their swords. But what you want to know is, is this travesty just bad-bad, or is it hilariously funny-bad? Given John Wayne’s bombastic delivery of his ever-cringeworthy dialogue, it definitely skews toward the latter. 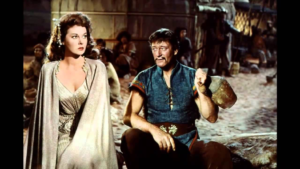 Hearing Wayne say stuff like, “Dance, Tartar woman—dance for Temujin!” or (to Agnes Moorehead) “You didn’t suckle me to be slain by Tartars, my mother!”—I mean, it’s just wonderful, and there’s so much of it, because he never shuts up. “She’s a woman, very much a woman. Could her perfidy be less than that of other women?” You can’t ask for better entertainment than that.